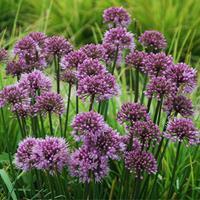 Thick and glossy, grass-like greenery drips with delicate pink umbels perfect for cutting. Deer won't be interested, but bees and butterflies love it! Like a clustered bouquet, ‘Millenium’ sends up loads of strong stems tipped with 2” umbels of rich rosy lilac from midsummer to fall. Bright glossy green foliage always looks perfect, and the onion scented foliage repels hungry deer and rabbits. 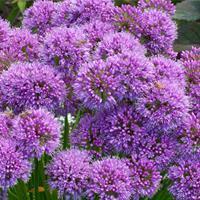 Forms a tidy clump that won’t spread around by seed and bees of all kinds absolutely love it! Latin Name: Allium nutans hyb. 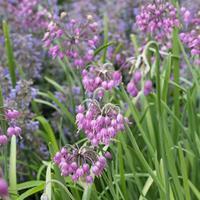 A new ornamental Allium with 2” balls of bloom with dark stems and richly colored buds opening to rosy violet flowers held aloft by strong stems. A vigorous grower that forms large clumps that will attract butterflies and repel deer and rabbits, it is perfect in dry spots in sun. Patented. The huge plumes of copper flowers tinted with apple green ripen large quantities of seeds that attract darting birds in late fall. Multi-branching with strong stems for loads of unusual cut flowers in late summer to fall. From the Greek word amaranthos, which means never fading, for these flowers do double duty as decorative dried flowers and as novel kitchen garden vegetables. 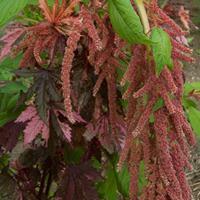 With its bright orange flowers and commanding height, this amaranth is a stunning addition to your garden. It is also an excellent food source: the greens are delicious and very high in important vitamins and minerals; the abundant tiny seeds are a popular and nutritious grain. This rare selection of a well-loved heirloom has a waterfall of warm coral flowers with a wool mohair texture. Punch up your garden by contrasting with lime green tobacco and harmonize with darker hues such as coleus 'Redhead' and dark leaved dahlias. Easy to grow in regular soils, they abhor cold and only do well when sown direct after frost into warm soil. They relish heat and humidity and come into their own in mid to late summer until frost. This rare selection of a well-loved heirloom has a waterfall of warm coral flowers with a wool mohair texture. Punch up your garden by contrasting with lime green tobacco and harmonize with darker hues such as coleus 'Redhead' and dark leaved dahlias. Easy to grow in regular soils, they abhor cold and only do well when sown direct after frost into warm soil. 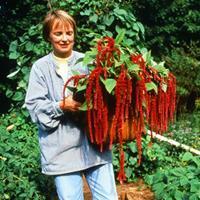 They relish heat and humidity and come into their own in mid to late summer until frost. This product is not compliant with the United-States-Canada Organic Equivalence Arrangement (USCOEA) and is not certified organic in Canada. Long knotted ropes of claret red drape almost to the ground, lending a dramatic touch to your garden. Combine with cleome, woodland tobacco and dahlias. Self sows. The soft chartreuse green tassels and green stems washed with yellow harmonize with soft yellows, such as found in 'Moonlight' nasturtium, and temper brighter yellows and gold. They also act as a foil to vivid magenta or purple. The light green leaves add to the decorative effect. Self sows. This product is not compliant with the United-States-Canada Organic Equivalence Arrangement (USCOEA) and is not certified organic in Canada. Vibrant psychedelic-green wooly flower spires will demand your attention! The thickly textured flowers bloom all summer and thrive in heat and humidity. One of the amaranths once called Prince's Feather, for its showy, fluffy top-knot of deep red flowers. An age old plant that is still valued for its edible and beautiful baby leaves in salads, and in 110 days, its purple-red nutritious seeds; still used by the Hopi to color cornbread red. Grow tithonia in front to hide its awkward "shins". A featured plant of Monticello's floral gardens, this ever-popular plant has beautiful foliage in vivid combinations of yellow, orange-red and green that develop in summer on the upper leaves of this sturdy, large-leaved annual. A heat lover that thrives in the high humidity of full summer, it is lovely paired with grasses and salvias in the border. The Great Purple Flower Gentle of 16th century herbals, this flower has rope-like, wine-red blooms spilling towards the ground.They are eye-catching additions to the cottage garden, paired with fine textured cosmos and bushy melampodium hiding its awkward "shins". Cut for fresh or dried bouquets. Listed in an 1810 seed list. Self sows. Luther Burbank himself introduced this "glistening, fiery, rosy-crimson" flower. Easily grown from seed, its young, leafy seedlings make delicious and nutritious cooked greens. As summer progresses, the bronzy maroon leaves develop the rich coloring that gives it its name. Grow with fine textured grasses, gomphrena 'Fireworks' or pair with kissing cousin Joseph's Coat for a vibrant late summer garden. Aubergine leaves and branched flower spikes smolder among flowers of dark red and chartreuse green in your garden. An Award of Garden Merit honors this full, long blooming selection. Beautiful and useful too; the young plants can be harvested as salad greens, and the nutritious seeds mature in late summer to feed you and local birds! Self sows. A traditional variety from Mexico, this amaranth has a lot to offer. Tasty young leaves, protein rich light seeds in long season areas, and in summer and fall, gorgeous tassels of garnet red that look wonderful with tall cosmos and branching sunflowers at the back of the border. Thrives in the heat and humidity of high summer. Good foliage is king, and this variety rules with beautiful ferny foliage all season long! Subtle hues of spring green tint the large white lacy blooms that flower for a long time in summer, providing interesting cut flowers and serving as a haven for beneficial insects. Grandmother's lace doily, in floral form! Ferny, fresh green foliage complements the large pure white umbels that look remarkably like the invasive, yet sentimental favorite Queen Anne's Lace. A graceful weaver among May-June perennials such as bellflowers, peonies, delphiniums and more it is of easiest culture, and is a superb cut flower.